Join Come Out & Play Festival, ESI Design, Hive NYC, and the YMCA for an all-day event focused on designing your own real-world games! Where: YMCA Park Slope Armory, 361 15th Street between 7th and 8th Avenues in Brooklyn. Learn about key game design principles from the pros, then break into teams to design your own games and set your own rules. Props will include everything from kickballs and traffic cones to rubber chickens and hula hoops. At the end of the day, teams will playtest and present their games to a panel of judges. 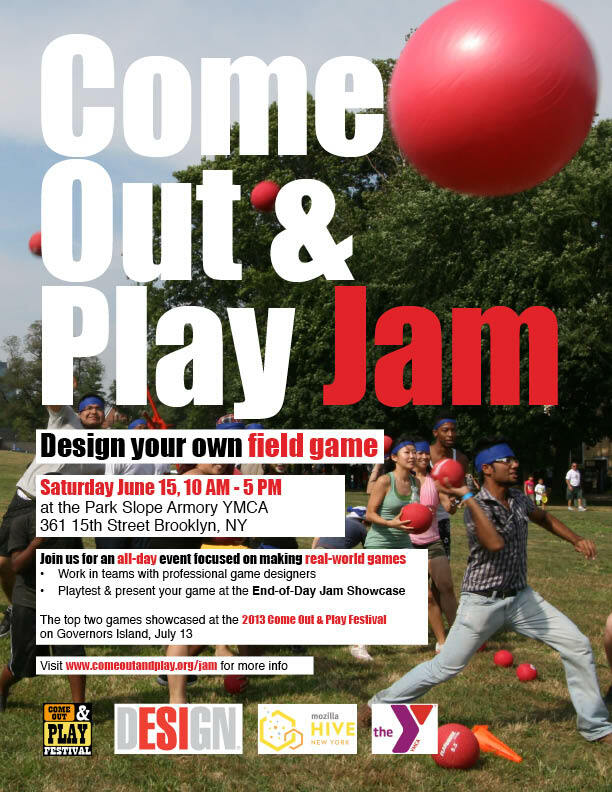 The top two winning games will be featured at the 2013 Come Out & Play Festival on Governor’s Island on July 13th! Directions: Take the F or G train to the 15th St/Prospect Park stop. Walk West on 15th St past 8th Ave, Park Slope Armory will be on your right.